Vibrant colored skirts glide through the room. Dance music pumps from all corners of the studio. The young dancers of Centro Salud Familiar La Fe chuckle as they buckle their shoes and assemble props in preparation for the cue to walk on stage. El Centro de Salud Familiar La Fe has become the solution for many parents struggling to find programs nearby for their kids to participate in. Girls facing the lack of recreational activities in Segundo Barrio have the opportunity to learn dance at Centro La Fe, through the Ballet Folklórico Toltec La Fe program. Dance is a method of wellness. Centro La Fe’s folklórico program stands to prove that the program promotes physical and mental well-being. 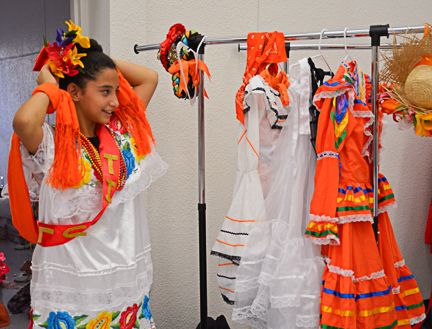 A young folklórico dancer adjusts her flowers next to bright orange garments. Photos by Emma Leslie for Journalism in July. Emmanuel Alfaro, dance instructor at La Fe, has taught dance at the clinic’s cultural center in Segundo Barrio for ten years. 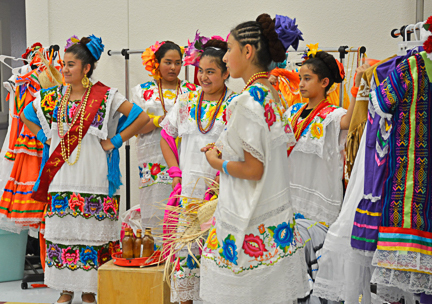 His troop consisting of 18 girls performs several styles of dance and focuses on the variations of ballet folklórico, a traditional Mexican ballet dance that conveys folk culture through dramatic elements such as bright colored garb and lively choreography. Alfaro’s work is in aspiration of helping his dancers to pick up the tools they will need in the future to become successful adults and change the world, as he knows they can. “I think it’s very important for young ladies to be part of groups like this because it’s not only teaching them about discipline and self esteem, … but they’re doing something positive for themselves,” he said. Folklórico dancers wait for their next routine to start. The public outreach from Centro La Fe creates an environment where youth can feel like they have a second home. “When we have an opportunity to speak to young people, we fully take advantage of it.” Says Estela Reyes-Lopez, Media and Public Information Officer for Centro de Salud Familiar La Fe. Ballet Folklórico Toltec La Fe has created through this dance program, an environment which strengthens the city’s cultural pillars, crucial to its structural integrity. 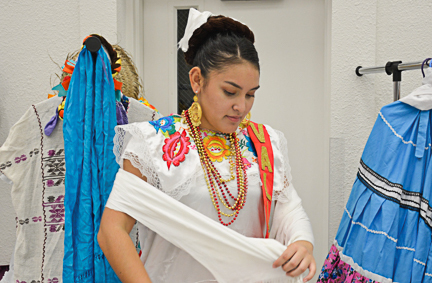 Young dancers from all over the El Paso area attend Folklórico dance practice twice a week for about two hours at Centro de Salud Familiar La Fe. Practice is tough for the kids, repetition after repetition, until perfection is achieved. Alfaro says he pushes his dancers to benefit their future in dancing. 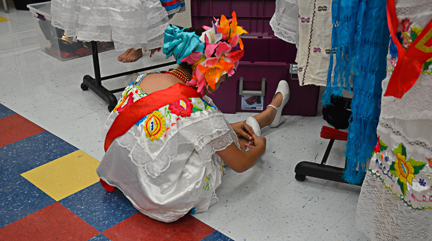 A Ballet Folklorico dancer at La Fe buckles her shoe before a performance. This independent attitude is taught early-on. It not only shows the girls the value of autonomy, but makes them think and act according to their own terms as well. “Some of the girls come in with low self-esteem. They’re not sure of themselves– shy, embarrassed, but when they get on that stage, the moment they walk out, and they love it on the stage. Sometimes they love it so much that they become little drama queens.” Alfaro joked. A Ballet Folklórico Toltec La Fe performer adjusts her shawl. A benefit of being involved in this dance program, is the variety of ages in participation. Younger girls and older girls alike learn to interact with one another. The older girls naturally fall into role-model positions for the younger ones, making the program a place of flourishing growth and maturity among the group. “I have little ones, and there are older kids here as well…, the little ones look up at the older ones, and the older ones become their mentors,” Alfaro explained. Through the instruction of dance, the girls are able to develop a confident demeanor. Performing ballet folklórico shows the girls how they can be creative, active, and well. “They’re involved in their community. They’re exercising, doing something positive, being proactive,” Alfaro explained. Aside from rehearsing at the studio, Alfaro explained that the ballet folklórico group has performed in official settings before. Alfaro says with pride, the ensemble has even performed out of town, travelling as far as San Antonio. 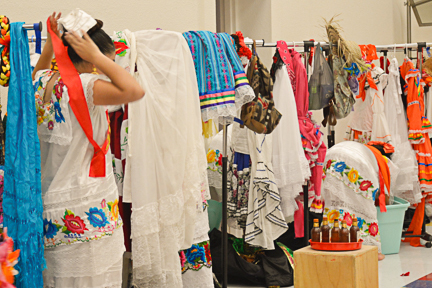 A Ballet Folklórico dancer prepares for a rehearsal at La Fe Cultural Center. In 2016, the ballet folklórico dancers travelled out of the state, as they were among the participants in the Día de los Muertos and Marigolds parade in Albequerque, New Mexico. The group is currently preparing for future performances. “We’re having a big event at the Chamizal, and these girls get to showcase what they can do,” Alfaro mentioned. As the girls of Centro La Fe’s folklórico program dance, prance, and leap, they continue to amaze the people of El Paso through performance. With the influence of dance, these girls are guaranteed to grow into confident, well-rounded women. This story was produced as part of the Journalism in July 2018 workshop for high school students at UT El Paso.